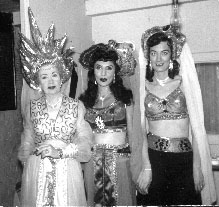 My mother Rose filled in as a harem girl once for The Royal Family of Magic. 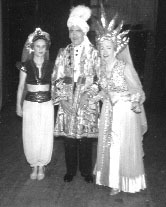 At left she is with Jack and Anne Gwynne in their famous stage costumes. At right, you can see she was a reluctant harem girl. Although she sang and played the guitar on stage, being a harem girl wasn't her bag. She remembers Jack looking for her to be the floating lady, but she was in the bathroom. Afterward, my mom said when she found out she was glad he didn't find her! At left, Anne, Helen. and Lillian Griffiths. 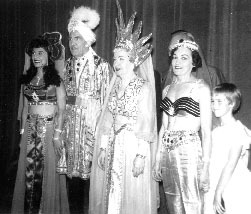 At right, The Royal Family of Magic (minus their son Buddy) from left their gorgeous daughter-in-law Helen, Jack, Anne, daughter Peggy, and her daughter Beth. I went to Oak Lawn High with her.